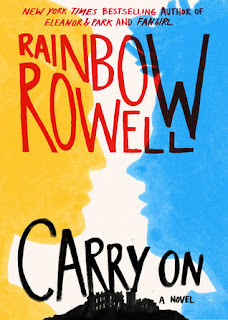 When I first heard the announcement that Rainbow Rowell was going to be writing a full length novel centered around her characters Simon and Baz I had a bit of a fangirl spazz. Simon and Baz, and the relationship Cath had with them, were my favorite part of Fangirl. I just loved how Rowell was able to tap into the fandom aspect in such a true to life manner; and much like Rowell, I couldn’t seem to get the two boys out of my head after I finished Fangirl. Carry On is longer than I expected it to be, which was a fantastic surprise, because as soon as I started reading I didn’t want their story to end. Rowell has created a world I wish I existed in! Every detail to Watford, and the Normal world was crafted with the attention to detail I’ve come to expect in her novels. It’s so well done that it makes everything feel so very real. I loved watching the relationship between Simon and Baz develop from the antagonistic beginnings to the wonderful state they finished the book in. Both of them are just so perfectly presented, with personality quirks and dialogue which feels true to each of them, that I feel as though I’ve met them myself, and become their friend. Baz’s choice to continue picking fights with Simon, to cover his personal feelings, was so him I just wanted to reach into the book and cuddle him. He’s such a tragic little sarcastic baby, and I adore him to pieces. And then there's Simon. Wonderful, oblivious, Chosen One Simon. Simon is that kind of character you can't help but want to befriend. The kid who may be 'destined to save the world' but is so down to earth and approachable. Add to that the fact that he really doesn't want to be the Chosen One, and really just wants to spend time with his friends and enjoy this life he's discovered. I fell in love with Rainbow Rowell's writing when I picked up Fangirl. Attachments doubled my love for her, and Carry On has driven me to levels of adoration I wasn't expecting. Carry On is a must read for fans of both fantasy and coming into your own stories. A book I will reread many, many times in the future. And a story I wanted to restart as soon as I finished the first time.